When patients read about laser vision correction they are presented with a multitude of names, acronyms, and abbreviations. Whether it’s LASIK, iLASIK, intraLASIK, PRK, LASEK, or epi-LASIK, it’s all extremely confusing even for the most enthusiastic patient who is about to undergo this life changing laser eye surgery. Is any technique really better than any other? How do doctors decide what to recommend, and how do you decide what to choose? Laser eye surgery for vision correction works by reshaping the curvature of the transparent layer of the eye in front of the pupil, called the cornea. The laser evaporates corneal tissue elegantly and delicately, making it flatter in short sighted (myopic) people and steeper in the long sighted (hyperopic). Overall there are really just two laser techniques, the difference being where on the cornea the laser is performed-either on the surface, or deeper under a thin flap of corneal tissue. Epi-Lasik and LASEK are almost the same as PRK except both remove the epithelium in such a way (the former mechanically with a blunt instrument which slides across the eye, the latter with dilute alcohol which chemically loosens the tissue) that it can be replaced again afterwards. Some claim that by replacing the epithelium, recovery is more comfortable and may give better visual results especially with high prescriptions. These claims are controversial and not universally accepted, as tests have shown that the original epithelium tends to dissolve and is in any case replaced by fresh epithelium growing in. The safety and ultimate vision are the same for all surface techniques- excellent . The second group of techniques used in laser vision correction involves cutting the cornea, and raising about 20% of the corneal thickness as a flap on a hinge- and more invasive and complicated procedure. The big advantage is that as the laser treatment is under the flap which is immediately replaced after the laser ablation, and not exposed as in the surface treatments, recovery is much quicker, most seeing well the next day with no discomfort beyond the first few hours. 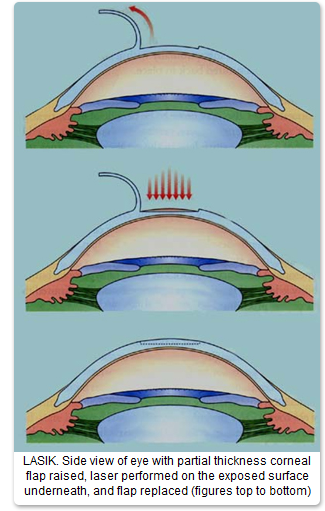 The average cornea is slightly more than half a millimeter thick in the center (500microns) and the flap is usually between 100-160 microns in thickness, which is folded back on a hinge of uncut cornea (see diagram). Most laser centers use an instrument called a microkeratome, which consists of a sharp oscillating and computerised blade that moves across the eye cutting the flap as it passes. This technique is called LASIK and is the most well known by today’s laser candidates. 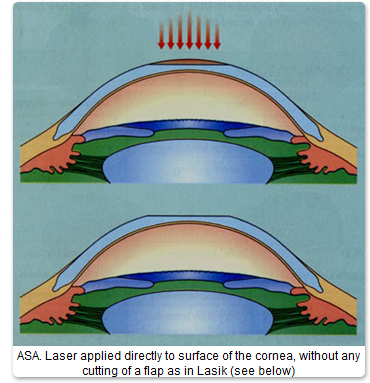 It is also extremely safe, although on the very rare occasions that a problem occurs during laser vision correction treatments, it is usually connected with the flap. IntraLASIK uses a special laser (femtosecond laser) to cut the flap (and another laser machine to perform the actual treatment of removing the glasses prescription). Supporters of femtosecond laser claim that it is safer than an oscillating blade, and that it creates more accurate and thinner flaps. Some studies seem to support this, but in fact modern microkeratomes are also extremely safe, can also create thin flaps, and only very rarely cause complications- and even when they do, they rarely cause significant long term problems for the patient. There have been few studies comparing femtosecond laser with modern microkeratomes so the issue is still controversial. Also there have been on rare occasions complications with femtosecond laser flaps also. Femtosecond laser treatments are generally much more expensive. When the intralase laser is used to make the flap and paired with a (wavefront) Customvue VISX laser treatment it is also referred to as iLASIK, and marketed as such. The main long term concern with LASIK and femtosecond Laser is that by cutting the cornea, it becomes structurally weaker. In about 1 in several thousand cases, and possibly much more frequently (exact figures are difficult to determine as not all cases are reported), after a few years the cornea can start to bulge out (a condition called ectasia) causing severe astigmatism, irreversible damage to vision and even a need for a corneal graft. Most at risk cases of ectasia can be predicted in advance e.g. candidates with thin corneas, irregularly shaped corneas, high prescriptions, and they can safely be offered a PRK surface treatment instead. But some cases occur for no obvious reason. So what are the considerations when deciding which technique is best for you? Firstly of course any potential candidate needs to be assessed to make sure he is a good candidate for either technique. Some patients are only suited for surface treatment such as those with thin corneas, which makes the decision easier. For patients who are good candidates for both techniques the choice is between two very safe and successful techniques, and both of which give equally superb results. Surface treatment (PRK) is a simpler operation but healing is slower requiring a few days off work (a small price to pay for the long term safety benefits) and vision takes a little longer to reach a good functioning level (5 days usually). LASIK is a more complicated operation involving the cutting of a flap which is the main source of the rare problems that can occur during the laser vision correction procedure. There is also the issue of the very rare but serious long term problem of ectasia. But with more rapid healing, almost instant results and with little interruption in daily routine it continues to be very popular. Most patients are back to work or school the next day. During a free consultation with Dr. Singer he will examine your eyes,check your prescription, measure your corneal thickness, and map the shape of your cornea which will allow him to make the proper recommendation for which treatment is best for you. Approximately 10-15% of patients at our clinic choose PRK surgery. The FDA recommends a minimum of three months between the treatment of the first eye and treatment of the second eye with PRK. The second eye may be treated sooner than three months after the first eye, or even at the same time; however, there may be risks associated with simultaneous treatment that are not present when the eyes are treated on different days. If you elect to have surgery performed on both eyes at the same time, you should understand both the possible advantages and disadvantages of you decision. Safety: You will not experience the risk of developing an infection in both eyes at the same time, which although rare, could lead to significant loss of vision in both eyes. Accuracy: The doctor can monitor the healing process and visual recovery on the first eye and may be able to make appropriate modifications to the treatment plan for the second eye if necessary, increasing the likelihood of a better outcome in the second eye. Visual Recovery: If the eyes are operated on separately, you will be able to function with your fellow eye while the first eye is healing. Therefore, you may be able to return to work and drive earlier. This is particularly important if your healing is delayed and vision remains blurred for a prolonged period. Satisfaction: You will be given the opportunity to determine whether the PRK procedure has produced satisfactory visual results without loss of vision or other undesirable side effects such as glare, ghost images, or increased light sensitivity. Convenience: It may be more inconvenient for you to have each eye treated at separate visits. This will necessitate two periods of recovery from the laser surgery and may require additional time away from work. Visual Recovery: There will be a potential period of imbalance in vision between your two eyes. This is especially important if you are unable to wear a contact lens in your unoperated eye. Visual Recovery: The balance in vision between your two eyes may be restored more rapidly. This is especially important if you are unable to wear a contact lens in your unoperated eye. Cost: Fees may be reduced and if both eyes heal satisfactorily, you may miss less work. Safety: The risk of infection and other healing complications is applicable to both eyes simultaneously. Therefore, if an infection occurs in one eye, it may also occur in the other eye. Although rare, a serious infection in both eyes can cause significant loss of vision and even legal blindness. Visual Recovery: Some patients experience delayed visual recovery and symptoms such as blurred vision, night glare or ghost images. There is no way to predict how long your eyes will take to heal, and some of these complications can result in prolonged recovery of normal vision. Blurred vision may continue in both eyes for several weeks, which could make driving difficult or dangerous and could interfere with your ability to work. Therefore, it may be necessary to take one or more weeks off of work. Satisfaction: Both eyes tend to experience similar side effects. If you experience undesirable side effects such as glare, ghost images, increased light sensitivity or corneal haze in one eye, you will likely experience them in both eyes. These side effects may cause a decrease in vision or other negative effects, and some patients have elected to not have their second eye treated.